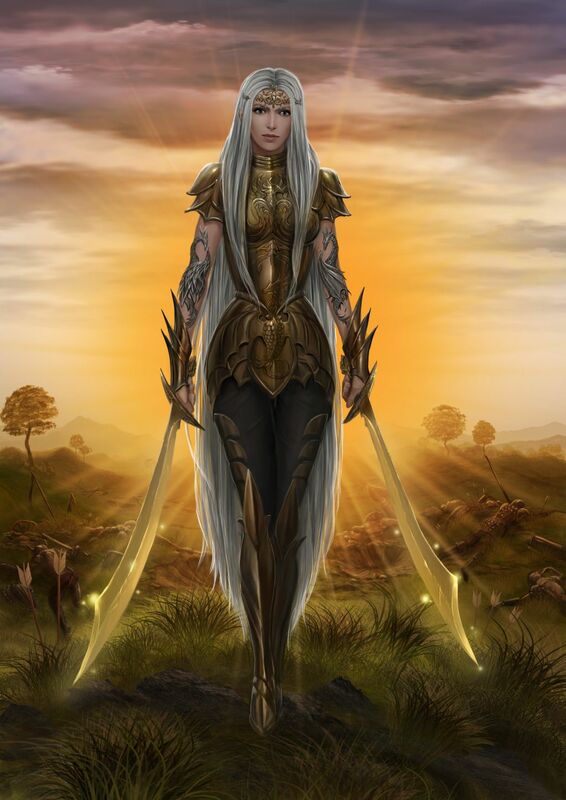 The Paladin Knights are great warriors of Creation and Light, fighting for what is right and good in the world. Much like the Priests, the Paladins, for most of history called the Templars, are an ancient class. Even Paladins not associated with the Church adhere to at least some of the tenets of good, for to stray from the path of righteousness is to risk losing strength as a Paladin. Millennia ago, mourning her death and celebrating her long life, Imithia performed the Rite of Ending for Pasiphae, a daughter of Sinope and Callisto, and in doing so founded the Church of Achaea. From the small band of devout followers led by Imithia, the Church grew and evolved, and gave birth to her two guilds, the Templars and Priests. The Templars served as protectors of the ancient Priests and as great warriors for the cause of Good. Today they serve in Targossas, the Dawnspear. In battle, a Paladin is fearsome indeed. In gleaming armour, wielding great weapons, with his falcon by his side, the Paladin strides or rides into battle ready to destroy those who would corrupt Creation with an overwhelming show of force. Beyond these mere physical gifts, the Paladin is armed with the rites of Devotion. These rites allow the Paladin to perform various holy deeds such as resurrecting the slain, dispelling illusions, and instilling overwhelming fear in his enemies. Rooted in the glorious force of Good itself, the holy magic of the devout renews within the Paladin (and Priest) with each new sunrise, allowing them to perform punitive feats and sacrificial miracles. Fervour Call rites to you in the heat of battle. Damnation Curse the eternal soul of your victim.